How many tweets can I delete? Our users have successfully deleted billions of tweets! It's never been easier to delete thousands of tweets in a few clicks and in no time. Only Windows is supported right now . We are considering offering the app as a web version so it's available on all platforms but we do not have any timelines for that. 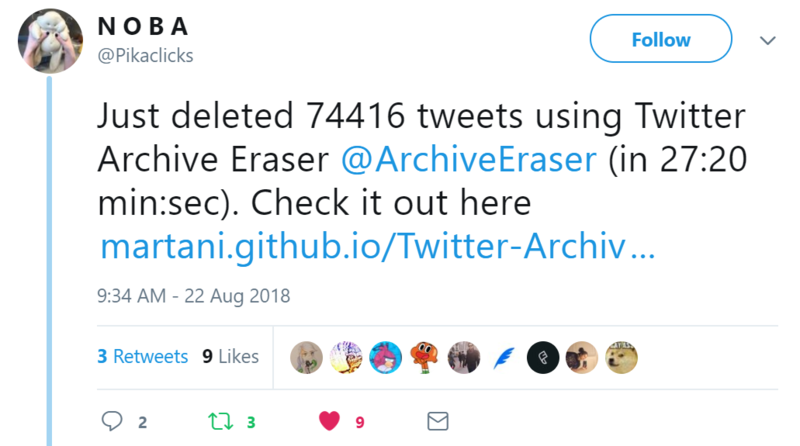 Twitter Archive Eraser can delete Favorites (a.k.a likes), but due to a known Twitter API bug, we cannot guarantee that you'll be able to delete any favorites/likes. Generally speaking, the Twitter API allows the deletion of the most recent ~3000 likes or so, but this could also be also 0! Note that even Twitter.com itself suffers from this bug and can't delete your Favorites/Likes. This is due to what's called the "phantom Favorites" issue. In short, even though your archive contains the IDs of the Favorite you need to delete, the Twitter API returns that you cannot delete them. Please be advised that deleting Favorites in not part of our offering and is not eligible for any refunds/support. Hence, Twitter Archive Eraser is best effort when it comes to Favorites: i.e. it will try to delete as many Favorites as the Twitter API allows. No. Any tweet that's deleted will not be recoverable. Please ensure you select only the tweets you wish to delete. 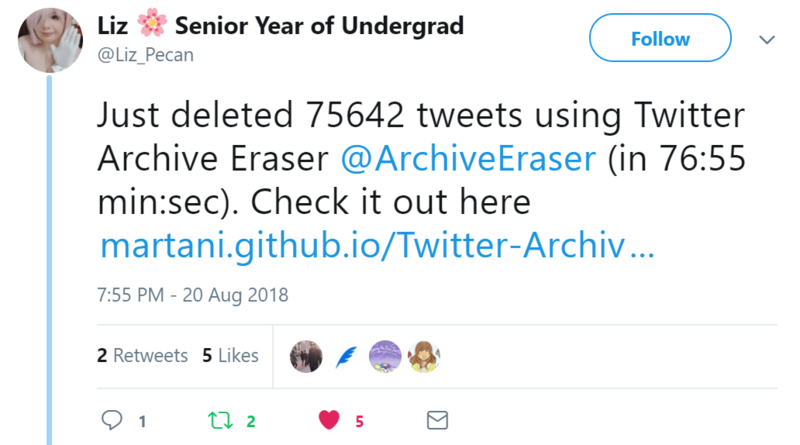 Twitter Archive Eraser takes no responsibility for accidental deletions. Twitter is by nature eventually consistent and your tweets count should eventually go down to reflect the number of tweets left on your account. However, sometimes the tweets number never reflects the actual tweets on your account (especially if you deleted everything). This is expected and is a Twitter limitation, but rest assured, your tweets will be well gone if deleted with Twitter Archive Eraser. more info on Twitter.com help pages. After you purchase a license key, you get redirected to our website where you'll find transaction details along with your license key. These details are also sent to your email (that your provided to PayPal) for your safe keeping. To enter a license key, head back to Twitter Archive Eraser, and click "Settings/License" on the top right of any window, then simply paster your full license key into the text area and click "Validate & Save License".